It was 20 years ago that astronomy, or perhaps even science itself, lost the best friend it ever had when Carl Sagan died at age 62 from complications of leukemia. For the better part of 2 decades, Sagan was the face of astronomy and science itself, the first true celebrity scientist since Albert Einstein. Now, 20 years later, the young people who Sagan sought to inspire into careers in science were, for the most part, not even born when Sagan was alive. So, who was Carl Sagan. Sagan is best known for his iconic Cosmos mini-series, which hit the airwaves in 1980. While Cosmos propelled Sagan to international fame, made him a household name, and the most recognized scientist in the world, there was a lot more to the man than Cosmos. Born in Brooklyn in 1934, Sagan was interested in science from an early age. Throughout his life, Sagan would recount two distinct episodes that set him on his life's journey of discovery. The first was a visit with his father to the 1939 World's Fair, which touted the world of tomorrow as envisioned through advances science and technology. The second event was a question (and its subsequent answering by way of a local public library): what are the stars? Though a 5 year-old Sagan did not know what science was, he was fascinated by what he saw at the World's Fair and left with a sense of wonder at the realization that the stars were Suns at a great distance (and that the Sun was a star up close). For the rest of his life, Sagan would credit his parents, who were not scientists and who actually understood very little science, for his career thanks to their encouraging of his early curiosity as a child. As an adult, Sagan would urge parents and adults across the nation and around the world to do the same for their children, lamenting that many potential scientists are put-off as children by adults' discouragement. Finishing high school, whose science courses he recounted as being rather dull and made of mindless memorization and experiments wherein the desired solution was already known from the start, Sagan entered college, eventually earning his Ph.D. in 1960. For Sagan, the timing couldn't have been better. 1960 was the dawning of the space age and Sagan was right in the middle of it. Degree in hand and scientific method in mind, Sagan quickly made a name for himself as a research scientist, playing a key role in t he understanding of the Venusian atmosphere and the planet that it shrouded. Long the subject of wild speculation because of its hidden surface and near-Earth size, Venus was, with a large credit to Sagan, finally understood to be the world it is: a hell-in-space if you will with an acidic atmosphere and a surface temperature hot enough to melt lead. Following his work on Venus, Sagan also took part in a variety of further missions to Venus and other planets through the1970s, most notably the Viking missions to Mars and the Voyagers to the outer solar system. Additionally, Sagan became a consultant to NASA and briefed many astronauts before their flights. In between, Sagan wrote several well-received books that started to cement his reputation not only as a scientist, but as an educator and a spokesman for popular science itself. Then came Cosmos, for which Sagan put up a considerable sum of his own money, worked constantly to secure donations for more, worked on publicity, risked his job (Sagan was constantly away filming and not teaching/researching at Ithaca University), and endured ridicule by his peers (some felt Sagan was neglecting his university duties while others considered popularizing science for the general public a waste of time). Through it all, Sagan and his team persevered and Cosmos finally hit the airwaves in August of 1980. His fame cemented, Sagan would return to a more traditional role as an academic teacher and researcher but would remain in the public eye as the face of astronomy and science for the rest of his life through appearances on TV, in documentaries, and through books. 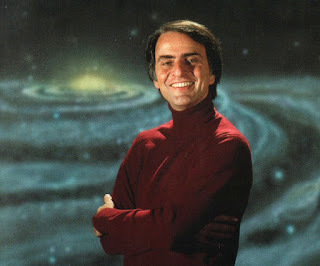 In the 1980s, after his marriage to Ann Druyan (one of his Cosmos co-writers), Sagan became increasingly outspoken on social issues, championing causes including but not limited to: the environment, education, world peace, and the teaching of the scientific method and its applications not only to science, but to being an informed consumer and citizen. Throughout the 1980s and 1990s, the awards rained down on Sagan for his achievements in a wide variety of areas. The scientist had become a renaissance man. Sagan's last book about astronomy, Pale Blue Dot, was published in 1994 and was inspired, in part, by a picture. After the 1989 Neptune flyby, the mission was complete for the Voyagers, but then Sagan had a big idea: why not turn the craft around and get a picture of the entire solar system? This was done and all 8 planets were captured in a single image, with Earth being a pale blue dot less than a pixel in size suspended in a sunbeam. In the 1990s, Sagan's activism, especially in the areas of protecting the environment and ensuring world peace, continued. As Sagan noted himself, Earth is tiny against the blackness of space and is, so far, the only place where life is known to exist in the universe. That undisputed, mankind has a duty to protect its only home but this is made more difficult because humans now have the technology to end all life on Earth through both environmental destruction and war, hence the need for global awareness. At age 60, Sagan was diagnosed with a rare blood disorder, myodisplasia, which commonly transforms into leukemia (as it did in Sagan's case). For the remainder of his life, Sagan's health was in a precarious state and was even saved by a bone marrow transplant. As 1996 progressed, Sagan's cancer returned and he once again endured another round of chemotherapy. In his final interview just days before his death, Sagan expressed optimism about not only his recovery but that of the future in general. Sadly, his immune system depleted by the chemotherapy, Sagan shortly thereafter contracted pneumonia, which took his life 20 years ago today. Yes, while Carl Sagan has not been with us for 20 years now, his legacy will endure so long as there are people on this Earth who are still inspired by a sense of wonder to ask big questions when confronted with the unknown, thus continuing the scientific journey of discovery that Sagan so passionately encouraged.